In the panoply of commanders who turned much of Central America into a killing field in the 1980s, General Ríos Montt was one of the most murderous. He was convicted in 2013 of trying to exterminate the Ixil ethnic group, a Mayan Indian community whose villages were wiped out by his forces. …In the late 1970s, after returning to Guatemala, General Ríos Montt reinvented himself. He took a Dale Carnegie course in human relations, abandoned Roman Catholicism, became a preacher in the California-based Church of the Word, and struck up friendships with American evangelists, including Jerry Falwell and Pat Robertson. …Mere days after the March 23  coup, Pat Robertson lauded Ríos Montt on The 700 Club as an anointed man of God for whom Americans should pray “day and night without ceasing.” Robertson also pledged that American evangelicals would donate $1 billion to his fledgling government, a contribution which, had it materialized (it did not) would have directly helped to circumvent the federal ban on U.S. military aid to Guatemala. North American evangelicals who were outside the inner circle of the Moral Majority, in the thrall of new emerging evangelical news media, regarded Ríos Montt from afar with wide-eyed and naive optimism. (“Terrorists fear ‘New Source of Intelligence'” boasted one evangelical tabloid, “Holy Spirit Reveals Whereabouts of Guerilla [sic] Forces.”) This sector of true believers refused to be dissuaded by news of human rights violations, which many evangelical U.S. Christians dismissed, as one evangelical magazine put it, as “either totally wrong or totally perverted.” This media-victim perspective runs like a rich vein throughout Joseph Anfuso and David Sczepanski’s fawning 1983 biography of Ríos Montt, a work in English published by an evangelical press before it was translated into Spanish. The “evangelical tabloid” referenced above was The Forerunner, which was produced by the controversial Maranatha Campus Ministries; and after Ríos Montt was ousted in 1983, he was a keynote speaker at a conference sponsored by Maranatha’s Dennis Peacocke. Ríos Montt also held a speaking tour in the USA, organised by Ben Armstrong of the National Religious Broadcasters, which included appearances on Robertson’s 700 Club and on Jimmy Swaggart’s TV programme (1). 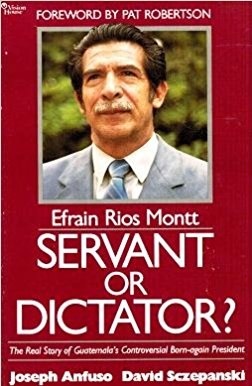 A little more can be said about the “fawning 1983 biography”, titled Efrain Rios Montt: Servant or Dictator?, for which Robertson provided the foreword. It was published by Vision House, of Ventura in California. The imprint was “a division of GL Publications” – “GL” here stood for “Gospel Light”, a company that was started by Henrietta Mears in 1933 specialising in Sunday School curricula. Mears also created GLINT (Gospel Literature International), which translates GL books and other evangelical works into other languages. The book’s authors were members of Gospel Outreach in Eureka, California, which was the Church of the Word’s umbrella body. The two men featured in a 1983 New York Times profile of Gospel Outreach, which explained that the group had emerged out of the Jesus Movement; apparently “hundreds of ex-hippies” formed an initial commune in the town under the direction of one James Durkin, “now 58 years old, a real estate agent who had had an off-and-on career as a part- time minister for the Assembly of God Pentecostal church”. Anfuso was the son of Victor L. Anfuso, who was Democratic Congressman from Brooklyn in the 1950s, and he told the New York Times reporter that “he found a meaning to his life after climbing the Himalayas and discussing Eastern religion with Indian gurus.” In 2010, he published a memoir, Message in a Body, which came with a cover blurb by William Paul Young, author of the The Shack, and endorsements from the likes of James Goll and the president of World Vision US. A foreword was provided by Kevin Palau, son of the Argentinian-born evangelist Luis Palau. Sczepanski, meanwhile, is the pastor of Durkin’s old church, now called the Gospel Outreach Reformational Church. 1. Some details here are from Sara Diamond’s 1990 book Spiritual Warfare. This book is also cited by Garrard-Burnett as the source for the “Army doesn’t massacre Indians” quote, referring in turn to Sectas y religiosidad en America Latina, October 1984, produced by the Instituto Latinamericano de Estudios Transnationales. Diamond and Garrard-Burnett also both refer to support for Ríos Montt in Christianity Today. Diamond further mentions the work of “Gospel Outreach, the Wycliffe Bible Translators/Summer Institute of Linguistics… and the Berhorst Foundation” among the Ixil; a PBS documentary called “The Gospel in Guatemala”, produced by Steve Talbot and Elizabeth Farmsworth; and, a few years later, Ríos Montt’s “Operation Whole Armor”, in which he and a Verbo missionary named Ronny Gilmore partnered with Bible Literature International of Ohio to distribute copies of the New Testament in Guatemala (pp. 167-168).